While the sane kids were dressing up and getting edible candy, the slightly less stable elements of the adult world donned their costumes and sought out the audible candy. For those in the Montpelier-Barre region, there was a tough choice for music. In the Barre corner, Burlington's Strangefolk. In the Montpelier corner, Middlebury's Viperhouse. The end decision: Everybody wins and call it a draw. Strangefolk started the Halloween celebration with their performance at Barre's Municipal Auditorium. Strangefolk and its management went through some effort to give the auditorium a "Halloween feel". Resting on the basketball hoops were stuffed scarecrows and the stage was lined with jack o' lanterns that spelled out Strangefolk. The audience was in full regalia with costumes ranging from aliens to little nymphs with flashing Christmas lights. The band also took the stage in full costume. The four were donned in black robes and they were somewhere between a grim reaper and a singing monk. Strangefolk's concert was much more than a celebration of Halloween for the concert coincided with the release of their second album Weightless In Water. If you enjoyed the composition of their first album, Lore, than Weightless In Water will be far from disappointing. The new album keeps with the Strangefolk tradition of intellectual lyrics, powerful vocals and extended instrumentals. Some of the highlights of the three set evening were Erik Glockler's "Who I Am" which was accompanied by longtime Burlington musician and producer Dan Archer. The song deviated from the typical Strangefolk style and focused a little more on the straightforward funk. 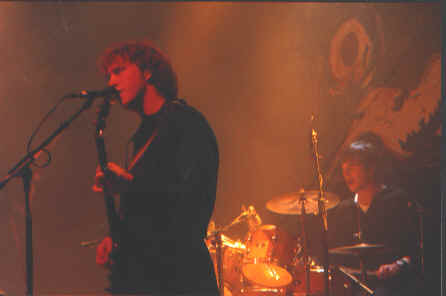 Perhaps the best song to find itself on the new album and also into the Halloween performance was "Furnace" which exemplified the best elements of the band: Erik Glockler and Luke Smith's steady and reliable rhythm; Reid Genauer's powerful, storytelling lyrics; and the endless explorations of Jon Trafton's guitar work. Further up the road from Barre, Viperhouse played in Montpelier's City Hall. The evening was dubbed "A Call For All Demons". Once again, the crazy costumes were coming out for a night of dancing. The best costume award went to the French waiter serving Spam Hors D'oeuvres. Unfortunately, the individual was unwilling to share parts of the costume for this hungry, Spam adoring author. A less appealing sight, was a women dressed up as Sissy Spacek in Stephen King's Carrie. With all the fake blood that was involved with this costume, I hope that she wasn't looking for a date. Once again, Viperhouse put on an killer show. It is easy to have misconceptions of jazz. Sometimes images of smoky, dimly lit bars come to mind. Other times of listening to virtually incomprehensible msuic comes to mind. Viperhouse does not fall into any such perceptions. Not a single body in the City Hall stood motionless as Viperhouse brought everyone to a full tilt boogie. With songs with names such as "Swag", "Dig On It", "Sensation" and "Gettin' It", there is bound to be some funky dancing. If there is going to be a costume of the evening award, there should be an award for best individual performance. On this particular evening, the accolade went to trumpeter Brian Boyes. Even during the longest instrumentals, Boyes never stopped shaking his booty and his stage antics kept the audience thoroughly entertained. On a musical level, his composition "Gettin' It" in which he shared the vocals with Heloise Williams was both an instrumental and danceable masterpiece. For some reason, Halloween is considered to be only a children's holiday. Somewhere along the line, our society deemed it immature for adults to dress up and act like a bunch of freaks. Besides the fact that Burlington seems like its is Halloween 365 days a year, its still good to see that older generations can celebrate Halloween just like their children.